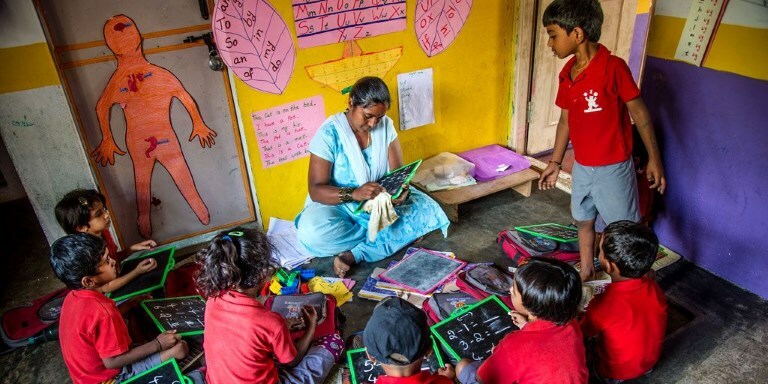 One of the inclusive businesses covered by the study is Hippocampus Learning Centres, a low-cost pre-school education provider in rural areas in India. It employs only local women and trains them to become teachers and later as school managers. Photo credit: ADB. While many inclusive businesses support the concept of gender-inclusivity, much more can be done to ensure that women’s economic empowerment is promoted in the workplace. Inclusive business models operate with the dual purpose of generating a reasonable profit and creating a tangible effect on low-income people’s welfare. As such, they have vast potential to help women in developing countries bring about economic change for themselves. But a recent Asian Development Bank (ADB) study, How Inclusive Is Inclusive Business for Women? Examples from Asia and Latin America, found that only 13 out of 104 inclusive businesses surveyed had set specific targets to promote the economic empowerment of women in the workplace. Compared to their mainstream counterparts, inclusive businesses benefit women by paying higher wages or prices and taking care of health and safety concerns, among other things. They also cater to women’s needs when they supply energy, water, education, or health services. Inclusive businesses can target women’s economic empowerment implicitly or explicitly. The implicit beneficiary model provides services or products in areas where women bear specific disadvantages, but does not necessarily address women’s empowerment specifically. For instance, by providing access to clean water in or close to the house, a utility can relieve women of having to retrieve water from far-away sources. Although creating tangible benefits for women, the implicit beneficiary approach does little to empower them directly. In contrast, the explicit beneficiary model takes measures to target women specifically in creating economic opportunity. Examples include recruiting women as distributors, designing career paths for women, creating a woman-friendly work environment, and providing access to goods and services specifically designed for the needs of women, such as reproductive care or financial services for women’s businesses. The How Inclusive is Inclusive Business for Women? study looked at a wide range of active inclusive business investments of ADB, Inter-American Development Bank, and International Finance Corporation in 2015, spanning the agriculture, health, education, energy, financial services, manufacturing, urban, ICT, and retail sectors. Each business was evaluated to see if it implicitly or explicitly outlined women’s empowerment policies in its mission statement. three-quarters of the companies made no mention of women at all. So what accounts for this low rate of targeted initiatives for women? The study, conducted for ADB by researchers from German-based Endeva, identified four broad constraints that impede engaging low-income women in the workplace in the developing world. The researchers proposed the following targeted actions to make inclusive businesses more inclusive. Companies should strive to ease the burden of multiple commitments on women. For instance Sri Lanka’s MAS Holdings offers on-site healthcare and childcare facilities to its female employees. Investors should incorporate gender-sensitive indicators into investment screening. Policymakers should set incentives for inclusive business and women’s empowerment. For instance the government of the Philippines is working on an inclusive business accreditation scheme that could include gender-specific indicators. Development partners should finance small, innovative women-inclusive business. Knowledge agents should integrate gender into their analyses and use assessment tools to set standards in women-inclusive businesses. Clearly, women’s economic empowerment is not a key concern for inclusive business models overall. While there are many social enterprise initiatives and corporate social responsibility activities that promote gender-related issues, these projects are small in scale and impact. Action from all stakeholder groups is necessary to make inclusive business work for women. Companies need to develop higher-impact business models for lower-income women. Investors should become more gender-savvy. Policymakers must create the conditions for women-inclusive business. Development partners should coordinate action and seed innovation. Knowledge agents should apply gender-sensitive analysis. A company’s financial returns and the social impact it may have for women and society can be maximized only if and when companies understand and address systemic issues of gender inequality. Companies that ignore the barriers faced by women in society often overburden them and run the risk of failure. Finding ways to engage women in a company’s value chain that incorporates an awareness of gender-based constraints creates mutual benefit for firms and women alike. ADB. 2014. Gender Tool Kit: Micro, Small, and Medium-Sized Enterprise Finance and Development. Manila: Asian Development Bank. ADB. 2016. Secret of Business Success? Empower Women. Article. Endeva. 2016. How Inclusive is Inclusive Business for Women? Examples from Asia and Latin America. Manila: Asian Development Bank. Isabel von Blomberg. 2016. Are inclusive businesses targeting enough women? Asian Development Blog. 8 March.